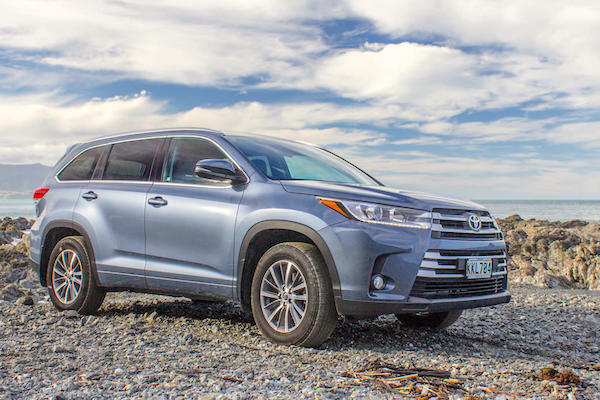 Rentals account for 68% of Toyota Highlander NZ sales in January. After four consecutive record years, the New Zealand new vehicle market continues to gallop ahead in 2018 with January sales up another 7.3% year-on-year to 14.834 units, the fifth straight record score for the month. Passenger cars and SUVs are up 6.4% to 10.797 while commercial vehicles are up 9.9% to 4.037. Toyota vastly beats the market with a 40% year-on-year surge to 22% share vs. 20.2% in FY2017, Ford (+6%) is back to 2nd place ahead of Mazda (+28%) while Holden tumbles down 34% to 7.8% share in 4th place vs. 9% in 2017. Kia shoots up 26% year-on-year and 7 spots on December to #6, Honda is up 29% to #10 and Subaru up 45% to #12. Further down, Tesla (+667%), Chinese carmaker LDV (+74%) and Skoda (+32%) make themselves noticed. Model-wise, rental sales keep the Toyota Corolla in the lead, accounting for 73% of its January total, with the two 2017 best-sellers taking the next two spots: the Ford Ranger at #2 and the Toyota Hilux at #3. The Toyota Highlander leaps up 8 spots on December to a brilliant 4th place (68% are rentals) while the RAV4 (50% rentals) makes it four Toyotas in the Top 5. The Holden Colorado (#6) and Mitsubishi Triton (#8) make it four pickups in the Top 8 while the Kia Sportage (#9) and Mazda CX-5 (#10) make it four SUVs in the Top 10. The Ford Focus (#7), Mazda3 (#12), Nissan Qashqai (#14), Ford Escape (#17) and Hyundai Kona (#20) also shine while the Mitsubishi Eclipse Cross breaks into the Top 25 for the very first time at #23. Full January 2018 Top 75 All-brands and Top 25 models below.